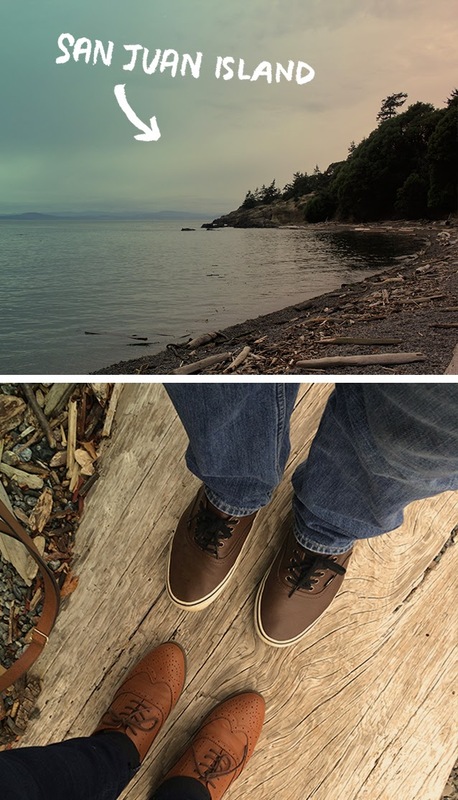 Last weekend Jordan and I finally made the drive north to Anacortes to catch a ferry and explore the San Juan Islands! It has been on my list of things to do for some time now, and it turned out we both had a few days off so we were able to make the trip. Click on to see more photos from our trip and read about our adventure. So I had a couple of days off work, and Jordan had a couple of days off work, and we didn't want to do our usual weekend thing...which usually consists of watching a Netflix show binge style one right after the other! Sooo, I decided we were going to Orcas Island! The night before our day trip I asked Jordan to figure out what time we needed to leave Seattle to catch the ferry...he figured it out and the next morning we set out on our adventure. We arrived in Anacortes around 11 a.m. an hour before the 12 p.m. ferry left, just like the WSDOT website advised us to do. The Orcas Island ferry is very popular so you are supposed to be in the ferry line an hour before it leaves to insure you get a spot. We drove up to the ticket window in Anacortes to be greeted by a nice elderly man, I asked for two tickets for the 12 p.m ferry to Orcas Island, he made a funny look, then kindly informed us that there was not a 12 p.m. ferry to Orcas Island, and that the next ferry would leave at 3:30 p.m. Bummer! So I asked the ticket man when and where the next ferry went. He responded with "well you can go to Friday Harbor at 1 o'clock today, and if you're hungry you can grab some lunch in Anacortes". So we drove the short 2 miles back to town and we had a delicious couple cups of clam chowder before we hit the ferry line again around noon to catch the Friday Harbor ferry. I wasn't actually too irritated that we had missed the Orcas ferry, I'm typically one to embrace what happens, I cheeseily (is that a word?) believe almost everything happens for a reason, so I tend to roll with the punches. We parked in a very long line of people who all had clearly made this trip before...they had packed food, blankets, and overnight bags. Jordan and I had...um our phones and a camera. We parked the car and went for a walk while we waited for the hour to pass, it was relaxing and the weather was pretty perfect for the time of year. The ferry arrived and we drove on, I seriously love the ferry, it's my favorite things, which may seem odd to people who ride a ferry everyday for a work commute or whatever, but I seriously love them. It's just peaceful. We arrived at Friday Harbor, parked the car and walked around the cute little town for a bit. Took a stroll to admire the boats and made fun of the strange names people come up. As were were walking back to the car I spotted a map of things to do on San Jaun Island...thought to myself that, well we paid to bring the car with us...might as well drive to the farthest point we can. So it was settled we got back to the car and drove to Lime Kiln Point. That turned out to be a pretty good idea because it was so gorgeous. Not only was the drive over there beautiful, the view once we got there was just amazing. We spent a couple hours taking photos and walking around at Lime Kiln Point, I was really wishing we might spot an orca! That didn't happen. It was still worth the trip though, and I am just so in love with this place that I am already planning time to go back, and next time an overnight trip, because as fun as the day trip was, I think a couple days here would be perfection. We caught the 7:30 p.m. ferry back, just in time to see the sunset on our ride home. I can't wait for our next trip north, and hopefully next time we will see a whale.